After changing the word of prayer forever with his Red Moon Rising, Pete Greig takes a sharp look at God's power to turn around lives completely. For years now Pete Greig has made it his cause and calling to open up prayer, and through it drastically alter what we think as possible. This is what inspired the 24-7 Prayer Movement. The idea of committing so wholly to prayer that not a single hour is left unfilled with prayer. Red Moon Rising bore witness to this movement, charting its first five years and the changes that came with total commitment to prayer. Now, in Dirty Glory, Pete Greig deepens his exploration of prayer by looking at how encountering God through prayer, and what his presence achieves, is still the same powerful rejection of back-slapping status quo. This is a book for the dissatisfied; those people who don't seek change, but expect it. These true stories of God's phenomenal impact across the world are not just stories to give you hope. They're there to stretch your belief in what is possible with God, to seek Glory in the ruin and rubble, and to bring action in despair. Dirty Glory won't inspire you to pray with comfy stories or healing, but rather show that there is only ever one response to wanting to see God move...To Pray and to Go. Dirty Glory by Pete Greig was published by Hodder & Stoughton in October 2016 and is our 1110th best seller. The ISBN for Dirty Glory is 9781473631700. If you only read one book this year - read this! A great encouragement to keep praying even in the bad times. Wonderful examples of answered prayer. The title is at first shocking but as the reader progresses through the book it becomes entirely appropriate. This is a life changing account of the progress of the 24/7 prayer initiative. The reader is asked to address big questions about the character of God. We are reminded that it is the character we see in Jesus, who was seen to love all people but especially the marginalised. He chooses the weak in order that we might witness His almighty power. Got a question? No problem! Just click here to ask us about Dirty Glory. The new book from Pete Greig - his first since 2007 - which continues the story of 24-7, the global prayer movement he founded, as begun in Red Moon Rising. 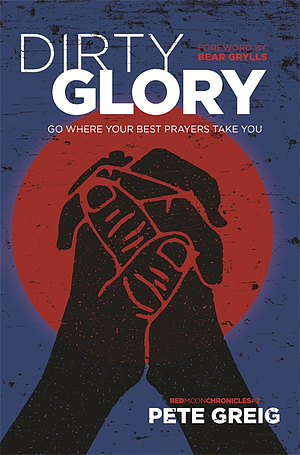 An autobiographical adventure story spanning four continents, describing one of the most exciting movements of the Holy Spirit in our time, Dirty Glory will inspire and equip those dissatisfied with the status quo and passionate about the possibilities for spiritual and social transformation in our time. "...will be called a house of Prayer..."
"...but you have made it a den of robbers"
"I will give you joy in my house of prayer"